What is the best thing about having an outdoor wedding? Isn’t it the colourful tents which can be anything from fairy-like to cool, depending on your creativity? They let you raise the roof with your imagination and add a touch of your personality. Weddings include a lot of colour, excitement, entertainment and fun. If coupled with an amazing decor, then it can be taken to a whole new level. 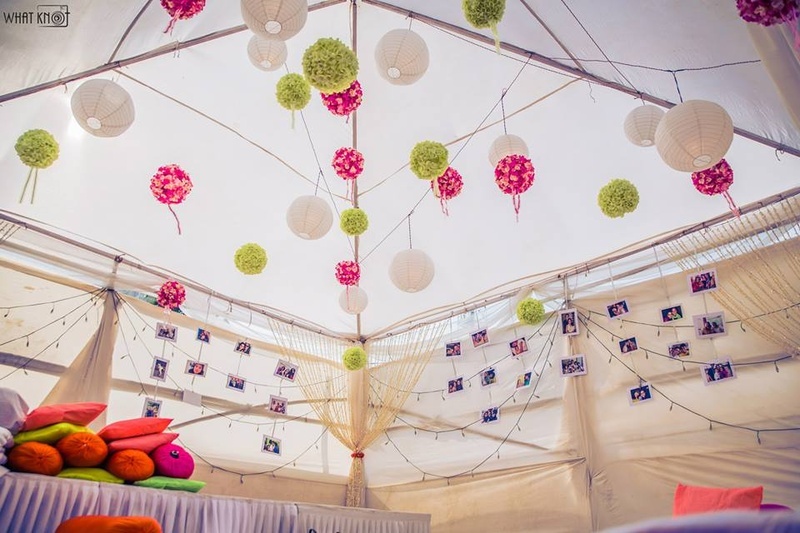 Tent decorations have become a rage these days and can set the entire mood for your big day. With a lot of decoration styles available in the market, you can create the kind of atmosphere you want. So, whether it is summer, monsoon or winter, here are some of the most beautiful ways in which you can set up amazing wedding tents. The idea of a romantic wedding under the beautiful blue sky is quite fascinating for couples. There are many draped fabric themes, which can be used to make your tent look gorgeous. You could use leg drapes, frame wraps, ceiling liners, etc. to spruce up the overall look of your event. Colourful drapes also add new dimensions to your space. A lot of emphasis has to be given on the lighting you use as it makes or breaks the whole look. The right kind of lighting helps in setting the mood and ambiance of your wedding ceremony. Whether it is globe lights or glow-in-the-dark paint spatters, you could intelligently light the venue to make a huge difference. For any wedding setup, linens can help decorate the venue brilliantly. It could be an indoor or outdoor wedding; linen makes a lasting impression on the guests. If you have a theme planned for your wedding, you can choose something that suits your preferences. Paper lanterns when used as a décor idea; add a distinctive touch to your wedding. The concept of ‘sky lanterns’ has also gained momentum over the years. In order to make their wedding a memorable affair, couples celebrate the most special day of their lives by releasing sky lanterns. Today, you get all kinds of lanterns in the market, such as LED, fluorescent, paper lanterns, etc. Chandeliers make any event come alive and exude an old world charm. You could place them at the entrance or on the stage; turning your wedding into a grand affair. Centerpieces have become quite a trend these days and is one of the most popular décor ideas for weddings. Having the right centerpiece at your wedding adds an elegant touch to your celebrations. A lot of weddings infuse floral decorations while designing the tents. The best part about these flowers is that they are not very expensive and bring in the much-needed colour and brightness to the whole event. Floral decorations are used at a lot of mehendi and sangeet functions, accentuating the whole look of the tent. Bangles add that bit of colour and beauty to your wedding décor. Using them as a chandelier on chairs, a centerpiece or simply hanging them from trees add a wow factor. They stand out from the usual décor themes and are enough for your guests to take notice. To add the much-needed zest to your wedding décor, incorporating kathputlis in your wedding theme is a great idea. Kathputli dolls create a traditional look and are reminiscent of the bygone era. This décor idea is seen in a lot of weddings held in Rajasthan. Using bird cages as décor adds a touch of versatility to your wedding décor. They add a vintage and enhance the cool quotient. Make your wedding day all the more special by integrating bird cages in your tent décor and take the décor to a whole new level. The weddings décor can set the mood for the entire evening; however, factors like budget, choices, and options should also be kept in mind. A good effort always gets translated into a ravishing setup and can make your guests go ‘wow’.